Find your passion for running! Passion on the trails. Remember why you run. 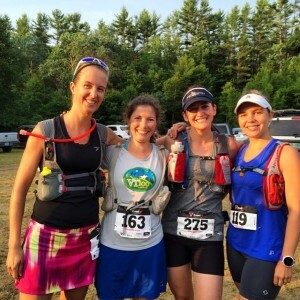 This weekend I ran the Bear Brook Trail Marathon. A marathon is typically 26.2 however this “marathon” was closer to a 50K (#justcallitanULTRA) with my Garmin clocking a total of 29.2 miles as my feet crossed the finish line. The last marathon I had run was the Boston Marathon in April and I hadn’t been planning on racing anything quite this long this summer until I was convinced it would be an epic adventure by my awesome friend Joanna. It is amazing how one race day can be so different from another. My race at Boston this year was important for me because I needed to finish it to help me overcome everything from Boston 2013 but it was definitely not my best race or fastest race. On Boston Marathon Monday I was a bundle of nerves, anxious, ready to run but feeling uncertain about what the race would bring. I ran a strong race (3:45 finish time) but felt unfocused during the race. I ran but did not feel strong. Finishing the Boston Marathon this year was hard but I needed to run it to make peace with what had happened last year. Boston Marathon day gave me the healing that I needed. On Saturday morning at the Bear Brook Trail Marathon I felt relaxed and was having fun hanging out with the girls before the race. The race atmosphere was very mellow and I felt like I was getting ready for an adventure. The contrast from the high stress environment at the Boston Marathon was strong. This was just the race day that I needed. I had no expectations about how long this race would take or how it would go but I was ready to get out there and run on some gorgeous NH trails. While Boston had helped me to heal in many ways. This race gave me back the joy of running and racing. I enjoyed every minute of that 29+ mile course even when it was extremely challenging and my body wasn’t sure that I could run any longer. I ran and I soaked up the course and loved the other runners pushing hard through their own challenges on the course. For me the Bear Brook Trail Marathon re-ignited my passion for running. I still was not the fastest out there but love my 6:07 finish time and the fact that I could finish with strength. I will share more about the race in my next post but just wanted to let you know how much this run fueled my fire to run with passion! I hope that you have found your passion! Way to go Sandra!!! Sounds like it was exactly what you needed!! I’m so happy this race was so good for you! To write that you enjoyed every minute of a challenging 29+ mile course is saying a lot. Sounds like a great race day! That’s a tough tough course!